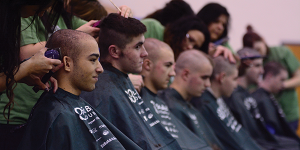 Cancer-survivor Frank Porzio, a junior, was among the more than 100 people who shaved their heads to raise awareness for childhood cancer at Student Programming Board’s St. Baldrick’s event Monday night in Burt Kahn Court. 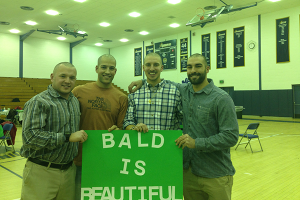 Several of Porzio’s fraternity brothers in Sigma Phi Epsilon shaved their heads to show their support, as well. “We all just realized that it’s an important reason, so we all just came out to support it,” Porzio said. 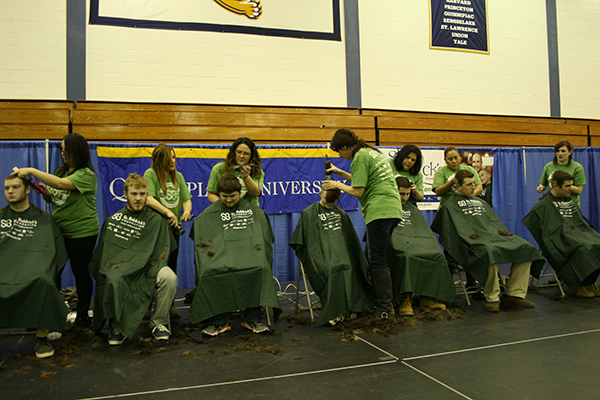 SPB teamed up with the St. Baldrick’s Foundation, an organization that raises money to find a cure for childhood cancer, and raised $9,440 as of Monday at the sixth annual event. 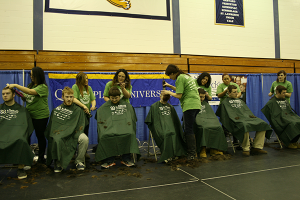 Prior to the event, students sign up to get their heads shaved and ask for donations from family and friends. Students’ fundraising goals can range from $50 to several hundred dollars. This year’s fundraiser was organized by senior Genevieve Bregoli, SPB’s Traditions and Community chair. Since October, she has been working with a California-based St. Baldrick’s representative to put the event together. “It’s always an emotional event just because it’s such a great cause, and it’s always great to see the community coming together to support one another,” Bregoli said. Senior criminal justice major Gavin McKay said he shaved his head because he supports the message it sends to the Quinnipiac community. 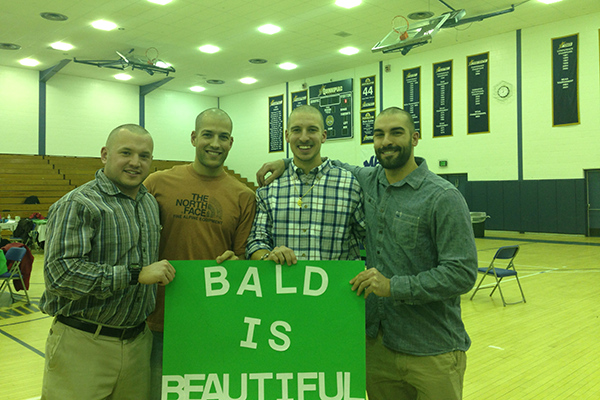 Bregoli said she “definitely” considers St. Baldrick’s to be a cause worthy of student support. McKay agreed, saying the event has grown significantly since the first one he attended four years ago.